October, which also happens to be Archives Month, has come to an end, which means it’s time to post about what we did over the last month. Alaska’s Digital Archives is undergoing a change in hosting, so we have been unable to upload files to the site. We kept busy helping researchers, including 24 different students from the two English classes we taught this fall. We talked to, and even visited, several donors, which resulted in us taking in seven new collections or additions to collections. Last month was also packed with events. 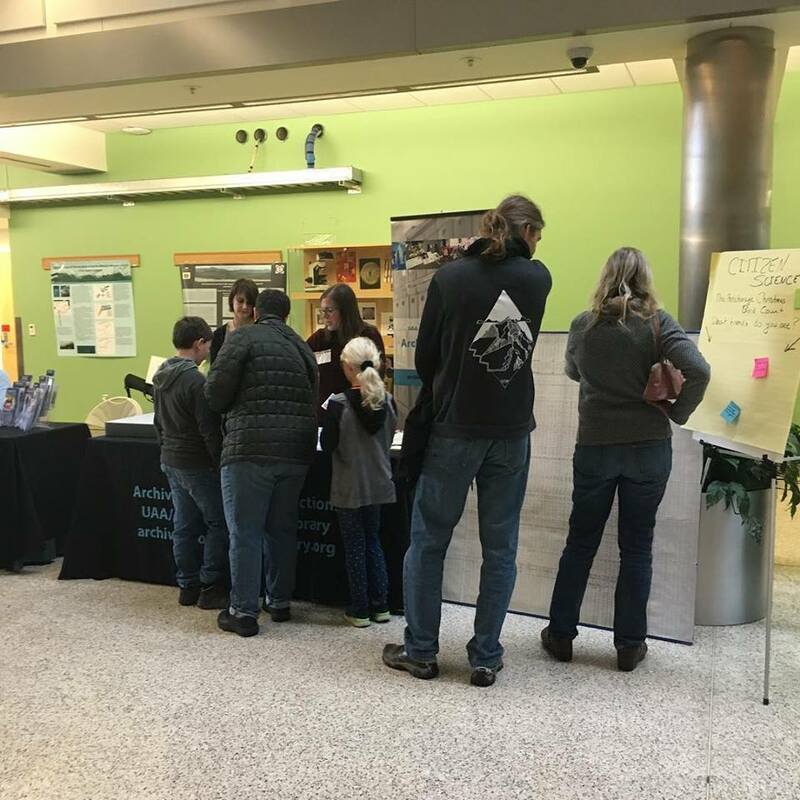 In addition to our usual table at STEM Day, we held a book enclosure workshop in celebration of Archives Month and had the first of a series of virtual meetings with archivists from all over Alaska. Our annual archives portrait, traditionally taken on Halloween. 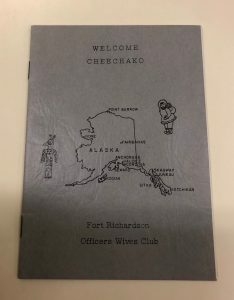 EPH-0414: Knik Knak Fort Richardson Officers Wives Club newsletter; 1961 May. 0.01 cubic feet. EPH-0296: The Northern Limelighter; 1967. 0.01 cubic foot addition. HMC-0121: Greater Anchorage, Inc. Fur Rendezvous records; 1938-2005. 0.2 cubic foot addition. 1964 King Regent sash won by Bill Rager. HMC-0434: Wiseman Trading Company records; 1925-1999, bulk 1940-1945. 0.35 cubic foot addition, which includes property information. Business records of a general store on the Middle Fork of the Koyukuk River. HMC-0879: Catherine Stadem papers; 1927-2015. 0.1 cubic foot addition. Papers of an Anchorage author and local theatre critic. HMC-0932: Walter Johnson papers; 1902-2016, bulk 1961-1978. 0.3 cubic foot addition. 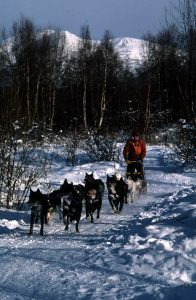 Personal and work related papers of an Alaskan public health physician. HMC-0945: Norman Rokeberg papers; 1974-2007. 9.2 cubic foot addition. The papers of a commercial real estate broker and member of the Alaska State House of Representatives from Anchorage. HMC-1268: League of Women Voters of Anchorage records; circa 1950-2014. 0.01 cubic foot addition (Ballot Review from 2014). Records of an Anchorage civic organization that works to ensure voters have easy access to participate in political elections at every level. UAA-0132: UAA. Native Student Services records; 1979-2017. 4.5 cubic feet.Records relating to the creation and operations of an educational support office for Native students. ENGL A351: Poetry. Instructor: Toby Widdicombe. 22 students. October 6. Students learned about where to find poetry in the Archives (it’s not always where you would expect) to use in an annotated bibliography. UAA STEM Day. Once again we brought the stereoviews and Euclid’s Elements. New this year was data from the Audubon Society’s Christmas Bird Count and a display of computer storage media through the years. October 6. Alaska Archivists inaugural meeting. 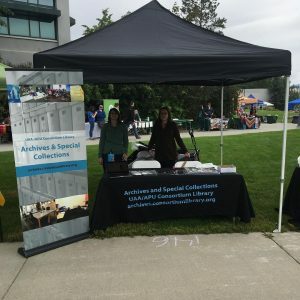 Alaska has a small number of archivists spread over a large area, and we have never been able to sustain the type of active statewide professional group that some states have. Thanks to generous funding from Northwest Archivists for continuing education, we were able to purchase a subscription to the video conference software, Zoom, to hold virtual meetings for people who work with archival materials as part of their jobs (whether or not their official job title is “Archivist”) to discuss issues facing archivists and archives in Alaska. The first meeting took place on October 11 and had 23 attendees. Archives Month book enclosure workshop. 5 attendees. October 20. With funding from Northwest Archivists, we held a workshop where participants learned to make enclosures for their books out of cardstock and Velcro. Arlene wrote a blog post about her experiences digitizing the glass lantern slides from the Clarence Leroy Andrews papers. 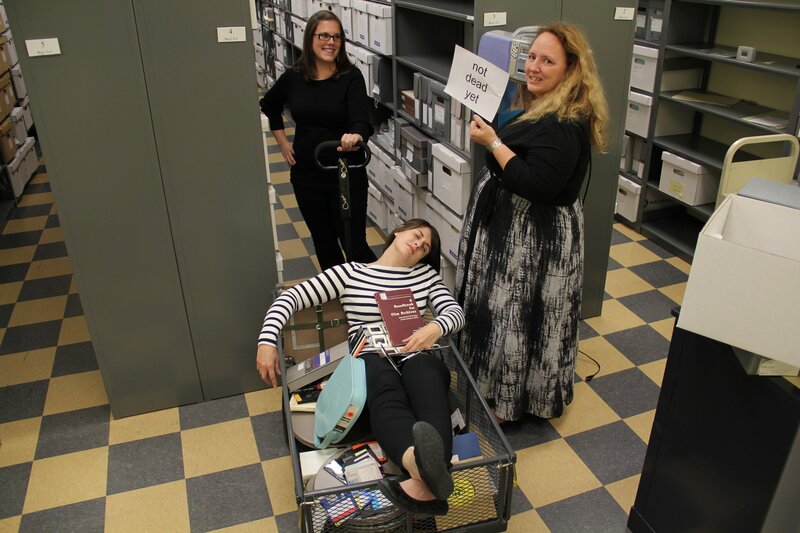 We released the 7th episode of our podcast, Archiving AK, in which Veronica interviews Chris Hieb and Leah Geibel from the Alaska State Archives. The post New in the Archives: October 2018 appeared first on Archives and Special Collections. August was quite a busy month for us in the Archives. We finally finished our legacy conversion project, gave tours to students who dropped by to see what we have, and spoke to donors and new faculty. Here’s a closer look at what we were up to. HMC-0425: Charles S. Harvard papers; 1912-1973. 0.4 cubic foot addition. Harvard was an engineer for the Alaska Railroad. The collection includes field books and ledgers of data and hand drawn maps of the Alaska Railroad right of ways, lease holders and plat information on properties adjacent to rail lines, locations of utilities and public services, plans for redirecting and refurbishing rail lines, descriptions of mile post and bench marks, arc, curve and angle calculations for theoretical and practical applications, and temperature conversion calculations. Charles Harvard underneath the road sign for Harvard Ave, which he named for himself. Photograph from: Betzi and Lyman Woodman papers, Archives and Special Collections, Consortium Library, University of Alaska Anchorage. HMC-0478: Marilynn S. Barks papers; circa 1939-1961. 0.10 cubic foot addition. This collection contains personal papers and correspondence relating to Marilynn S. Barks’s life in Alaska. 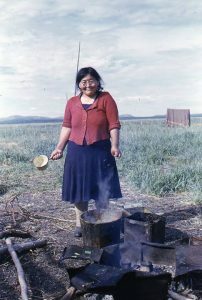 The majority of correspondence concerns her husband and his work in the mines, as well as life in Anchorage during WWII. Other correspondents include her brother Jack, Charles Seaton Harvard, L.S. Wickersham, relatives outside of Alaska, merchants, and an astrologer. The personal papers include insurance policies and receipts, as well as tax forms and mining claim information. HMC-0667: Arctic Power records; circa 1978-2003. 35 cubic feet. Records of an organization that supports opening the Coastal Plain of ANWR to responsible oil development. HMC-0687: Frederick Milan papers; 1870-1995, bulk 1942-1995. 9.5 cubic feet. Milan was an anthropologist, linguist, and human physiologist who worked in Alaska and other Arctic regions. HMC-1296: Bob and Gayle Curtis photograph albums; 1965-1983. 0.8 cubic feet. 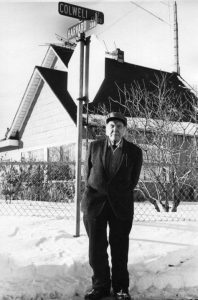 The collection consists of five photograph albums created by or given to Bob and Gayle Curtis, mostly relating to Tikchik Narrows Lodge. 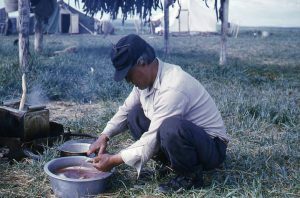 The earliest album, dating from 1966 to 1970, documents family life, including the birth and early childhood of the couple’s son, Robert, as well as activities such as camping, fishing, and the building of Tikchik Narrows Lodge. The other four albums document fishing trips to Tikchik Narrows Lodge. Subjects of the photographs in these albums include groups of people, Tikchik Narrows Lodge, fishing, boats, airplanes, and scenery. HMC-1297: Millard Preston photographs; 1941-1944. 0.01 cubic feet. 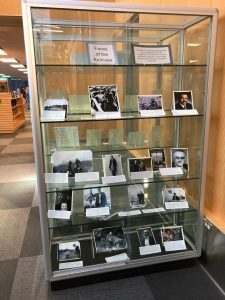 The collection consists of photographs taken by Millard Preston during his time working on construction of the Alaska Highway in Alaska and Yukon, as well as some photographs from the Aleutian Islands, particularly Adak. HMC-1298: Melvin Reed Mower papers; 1942-1943. 0.01 cubic feet. 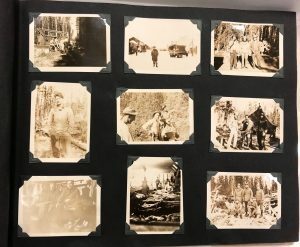 Mostly photographs of a man who worked on the Whittier Tunnel and on Rugged Island in Resurrection Bay. 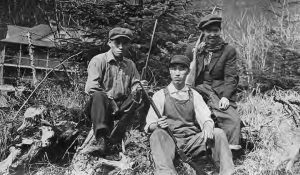 Subjects of the photographs include Portage Lake and Glacier, Rugged Island, Whittier, a fishery, a hike Mower and others went on where they found and buried the body of Jack O’Brian, and the construction of the road at Bear Valley, Portage. Portage Lake from the Melvin Reed Mower papers. We also added several ephemera collections. 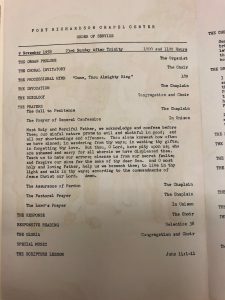 EPH-0399: Fort Richardson Chapel Center church service programs; 1958, 1959. EPH-0400: Music with Mary Martin program; undated. EPH-0401: Sheldon Jackson High School and Junior College leaflet; undated. EPH-0402: Alaska tourism pamphlets; undated, 1957, 1958. 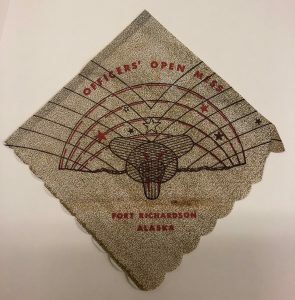 EPH-0403: Fort Richardson Officers Club memorabilia; 1958, 1959. EPH-0404: Alaskan Concert Tour Boston University Glee Club program; 1958. EPH-0405: Anchorage Kiwanis Club “A Project with a Dual Purpose” pamphlet; undated. EPH-0406: Eye, Ear, Nose and Throat Foundation of Alaska, Inc. pamphlets. 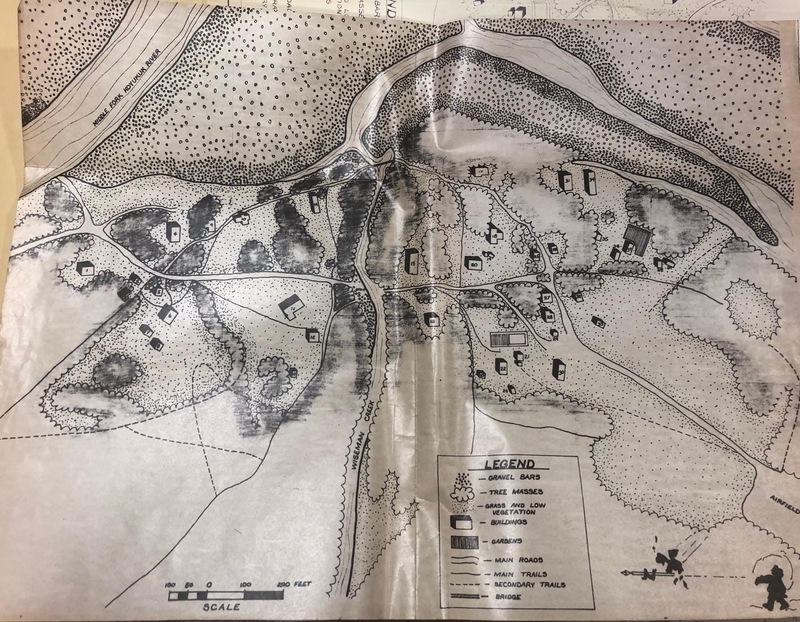 EPH-0407: U.S. Army “Information about Fort Richardson” booklet. EPH-0408: Anchorage High School. Thespian Troupe 700 “The Little Dog Laughed” program; 1958 February 14-15. EPH-0409: Valdez Breeze newsletter; 1958 June 21. EPH-0410: Fort Richardson Officers Wives Club booklet and calendar; 1957-1958. EPH-0411: Elmendorf Air Force Base and Fort Richardson Armed Forces Day program; 1958 May 17. EPH-0412: Fort Richardson Protestant Parish The Chapel Chimes newsletters; 1958. August saw the end of a project we were all looking forward to completing: the conversion of our older collection descriptions into the currently accepted national standard for describing archives (DACS or Describing Archives: A Content Standard). 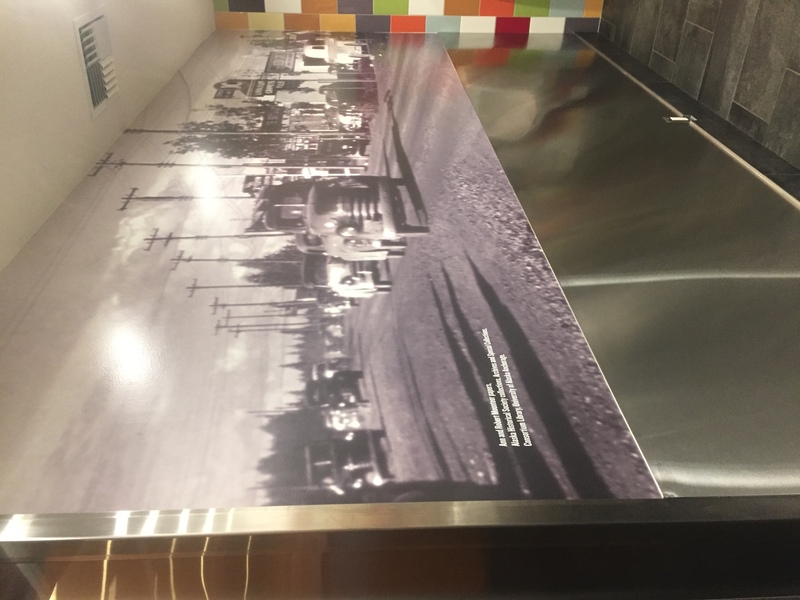 You can read more about that project and why it was important to us in Arlene’s blog post “Finishing a decade-long project“. HMC-0109: Victor Fischer papers; 1950-2009. This collection consists of papers relating to the public career of Victor Fischer. Included are files relating to his legislative activities as well as to his work in planning. Among the legislative papers are files on reform and ethics, petrochemical development, the Homan trial, the Sheffield impeachment, and other matters. HMC-0192: Old Believers naturalization ceremonies recordings; 1975, 1979. 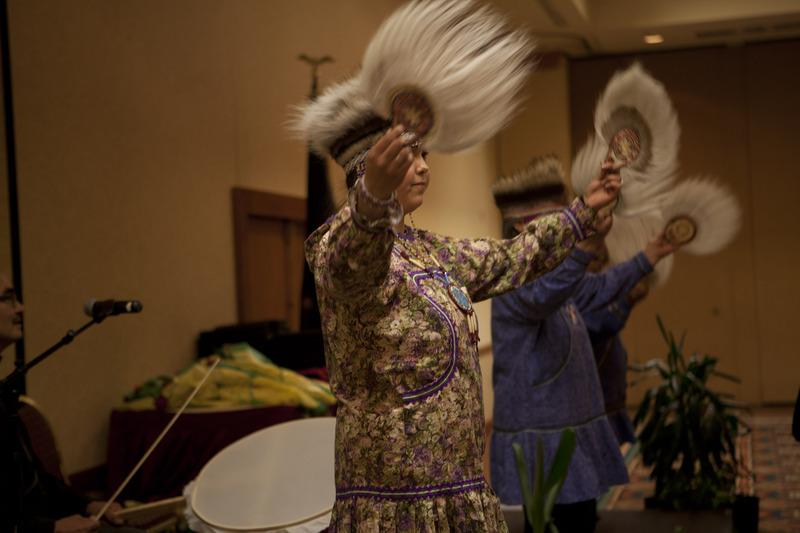 Recordings of naturalization ceremonies for members of the Old Believers living in Alaska. HMC-0198: People’s Vote Must Count Committee records; 1959-1981, bulk 1981. Records of a committee that supported the creation of a park on block 42 of Downtown Anchorage, instead of a convention center. HMC-0204: Potter Section House report and plans; 1980-1986. The collection consists of a copy of a report recommending the preservation and reuse of the Potter Section House, written by the Municipal Historic Landmarks Preservation Committee. There is also a Potter Section House “Site Development Plan” and two site maps created by the Alaska Department of Natural Resources, Division of Parks and Recreation. HMC-0224: Evan Lester Sitter film; 1948. This collection consists of a VHS videocassette copy of a color 16mm film made by Sitter while on the trip to Alaska in 1948. The trip included stops at Glacier National Park, the Canadian Border Customs Building, Dawson, the Peace River Bridge, Fort Nelson, Lake Louise, Laird Lodge, the Alaska/Yukon Border, Fairbanks, Nome, Kotzebue, Copper Center, Thompson Pass, Valdez, Juneau, Ketchikan, and Seattle. Included are pictures of mountains, rivers, waterfalls, glaciers, lakes, buffalo, bears, a fish wheel, ships, and planes. HMC-0235: Dale A. Stirling papers; 1980-1986. This collection includes materials related to Heritage North and files of Poetry North Review. HMC-0240: Alexander W. Swanitz letters; 1909-1910. This collection consists of two copied letters from A. W. Swanitz to George Love of Valdez, Alaska. 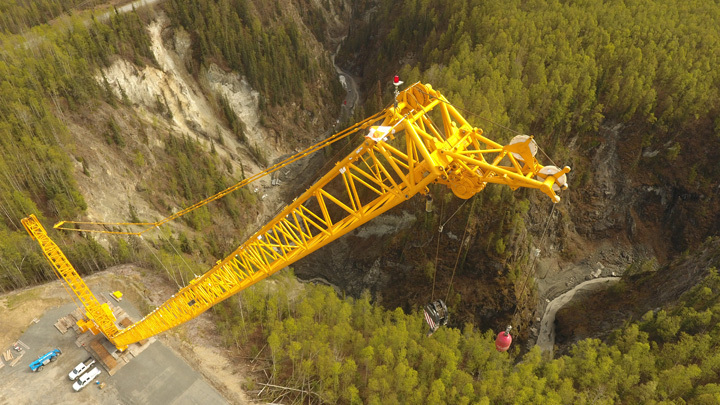 The first concerns business concerns and the second relates to construction of the Alaska Northern Railway and politics. HMC-0340: Elvera Voth papers; 1961-1978. 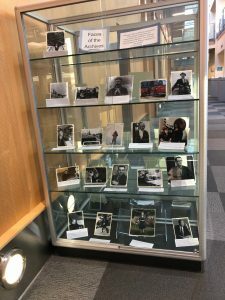 The collection consists of papers relating to Elvera Voth’s work at Anchorage Community College, Alaska Methodist University, and the University of Alaska, Anchorage, and with the Sunday Afternoon Concert series. Included are concert programs, letters of appreciation, photographs, newspaper clippings, and similar papers. HMC-0390: Thirteenth Regional Corporation records; 1971-1997. Records relating to the administration and operation of the Thirteenth Regional Corporation. Included are records relating to the board, the shareholders, the management of the corporation, corporate finances, subsidiaries and business ventures, law cases, corporate land claims, and corporate publications. HMC-0433: Robert Wethern papers. ; undated, 1973-1994. 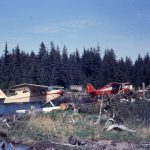 This collection consists of Robert Wethern’s papers regarding proposed articles and a book concerning the life of Grenold Collins, an Alaskan wildlife agent, guide, pilot, and sportsman. 32 images from Jukichi (Jack) Nishida photographs; HMC-1291. Nishida worked for the Ellamar Mining Company from circa 1913-1918. Three men in Ellamar. Jukichi Nishida is the man in the middle. From: Jukichi (Jack) Nishida photographs. 24 images from the Elmer Sundsby papers; HMC-0238. 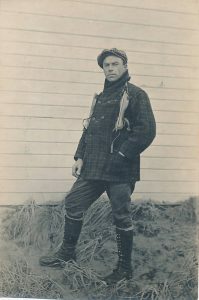 Sundsby was a fisherman in Halibut Cove, Alaska. 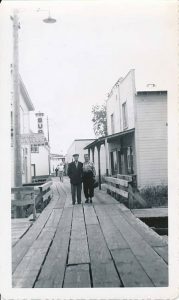 Carl Berg and Hannah Valentine in Seldovia, 1954. From: Elmer F. Sundsby papers. 6 images from Melvin Reed Mower papers; HMC-1298. Photographs taken during the construction of the Whittier Tunnel and Portage Glacier Road. 68 images from McGlashan and Monsen family photographs; HMC-1278. Photographs primarily taken in Naknek and Akutan. We also created two new topic guides. 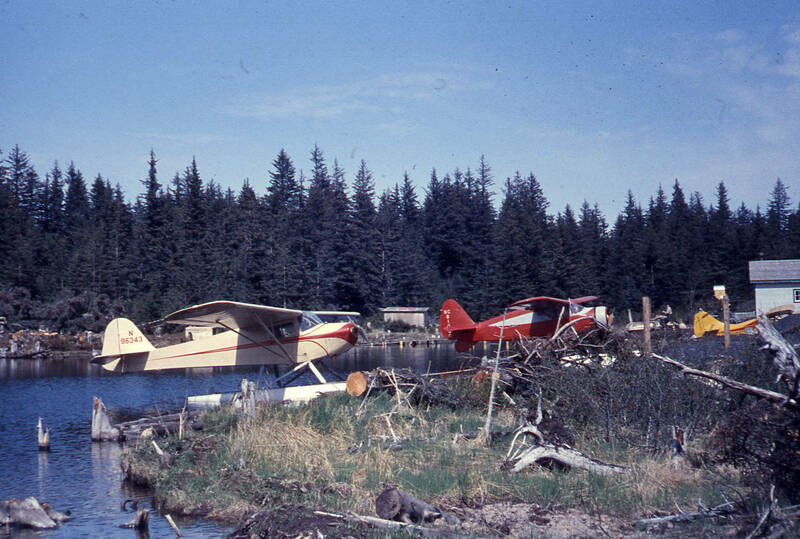 One topic guide contains our collections which relate to aviation in Alaska. The other topic guide contains our collections which relate to Seward, Alaska, including the 1964 Earthquake, the Jesse Lee Home, military presence, and the Seward Sanatorium. It is important to remember that our topic guides are not comprehensive. This month, for our podcast Archiving AK, our intern, Anna, interviewed us. In this episode we discuss what we hope to see for the future of the archives profession, what skills and knowledge we would like new professional archivists to have obtained in their archives classes, the role of professional associations in our work and development, and the types of things we wish people knew about our work. We spoke at New Faculty orientation, had visits with donors and potential donors, and gave individual and group tours to the family of a donor, students, and potential donor. We also had a booth at Campus Kick-off to chat with students and faculty about the Archives. Gwen and Veronica at Campus Kick-off. 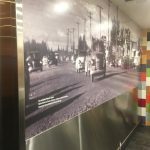 The post New in the Archives: August 2018 appeared first on Archives and Special Collections. The post Archiving AK Episode 2: Interview with Pierce Bateman appeared first on Archives and Special Collections. 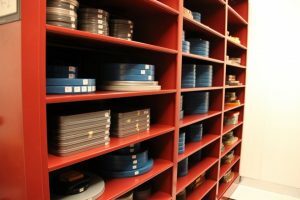 The post Scenes from the Archives: So many questions and no answers appeared first on Archives and Special Collections.